Nearly 20 years after she discovered the skeleton of a pre-historic horse at Ashfall Fossil Beds, former intern Andria Skaff Niles returned to the state historical park this past summer to finish excavating her find. For 11 fruitless weeks back in 1996, a teenaged Niles worked in the same spot, using a two-inch paintbrush to brush away ancient ash, collect it in buckets and haul it away. During the 12th and final week, she uncovered a tooth. Then more teeth. Then skull bones. She had found the fossilized remains of young three-toed horse, about 30 inches high. Niles wrote a prize-winning essay, published by Plains Song Review in 1999, about the thrill of being the first human to see and touch the skeleton of an animal that died nearly 12 million years ago. Yet, for nearly 20 years, a question lingered: Was the fossil’s missing pelvic bone, likely removed by a scavenging animal soon after the little horse’s death, hidden somewhere nearby? Niles’ three-day return to Ashfall in late June yielded an answer, though a disappointing one. The pelvis was gone. “That’s the nature of paleontology,” Niles said. Niles was one of those youngsters who dreamed of being a paleontologist for as long as she could remember. 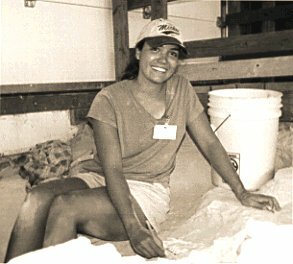 Even before she graduated from Millard North High School in 1995, she visited the University of Nebraska-Lincoln to meet Mike Voorhies, the UNL paleontologist who discovered Ashfall site in 1971 and spent his career developing it. Ashfall is the site of an ancient water hole where hundreds of animals perished nearly 12 million years ago. A massive volcanic eruption in what is now Idaho spewed abrasive dust for hundreds of miles, slowly suffocating animals that inhaled it. Fossils found at Ashfall have been left in the positions where the animals died. A large shed, nicknamed the “rhino barn” after many of the fossils found at the site, protects them. Student interns like Niles have been responsible for much of the excavation at Ashfall. Five or six interns are hired each summer. The 2015 group included students from Pennsylvania, South Dakota, Missouri and Chadron State College. It’s a competitive position, with 40 to 70 candidates vying for the slots each year, said Ashfall superintendent Rick Otto. The horse skeleton was found near a walkway in the rhino barn, which prevented further excavation. More digging became possible after the much-larger Hubbard Barn replaced the original barn in 2009. After graduating from UNL, Niles earned a master’s degree in Arizona. She married a geochemist, had three kids and taught in high schools and community colleges. The family moved to Houston in 2005 after her husband was hired by NASA. Voorhies and Otto invited Niles to return to Ashfall to search for the missing pelvic bone after she and her family stopped there during their 2014 summer vacation. Former interns often stop by the park, frequently with families in tow, said Voorhies, who continues to spend summers at Ashfall despite retiring 10 years ago. Ordinarily, only current interns are allowed to dig in the rhino barn, but staff made an exception for Niles, Otto said. Ashfall closes for the season Oct. 11. Selection of 2016 interns begins when the positions are announced, likely in late January. The internships run from the third week in May through mid-August. The fossilized remains of young three-toed horse, about 30 inches high.